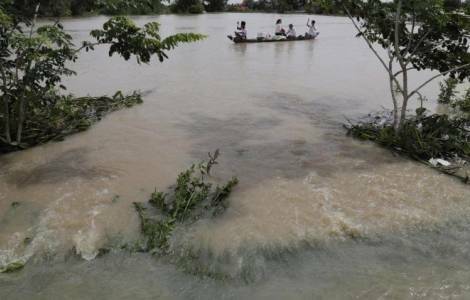 Seoul (Agenzia Fides) - Following the sudden collapse of dam in southernmost Attapeu province in Laos, Cardinal Andrew Soo-jung YEOM, Archbishop of Seoul, sent a message of condolence to the victims of the tragic disaster and supported $50,000 emergency relief funds. In the message, sent to Agenzia Fides, Cardinal Yeom expresses "deep sadness at the loss of life and injury caused by the dam collapse", assuring prayers for the "repose of the deceased and God’s consolation for all those Laotian people who grieve the loss of their beloved family and friends". "Most of all - the Cardinal continues - I deeply hope that the missing persons can safely get back to their families as soon as possible and the victims can receive necessary supports and aids as fast as possible". While Cardinal Yeom sent his letter of condolences to the Laotian people through the Apostolic Vicariate of Pakse, the territorial missionary jurisdiction of the Catholic Church in Laos, the "One Body One Spirit" Movement of the Archdiocese of Seoul offered $ 50,000 to Archbishop Paul In-Nam Tschang, Apostolic Delegate in Laos as emergency funds. On 24 July Pope Francis sent a message to the Laotian authorities, through the Secretary of State, Cardinal Pietro Parolin, in which he expressed "heartfelt solidarity with all those affected by this disaster" and assured the prayer "especially for the repose of the deceased, the healing of those injured and the consolation of all those who grieve the loss of their loved ones and who fear for the lives of those still missing". Pope Francis also offered his encouragement "to civil authorities and all those involved in the search and rescue".